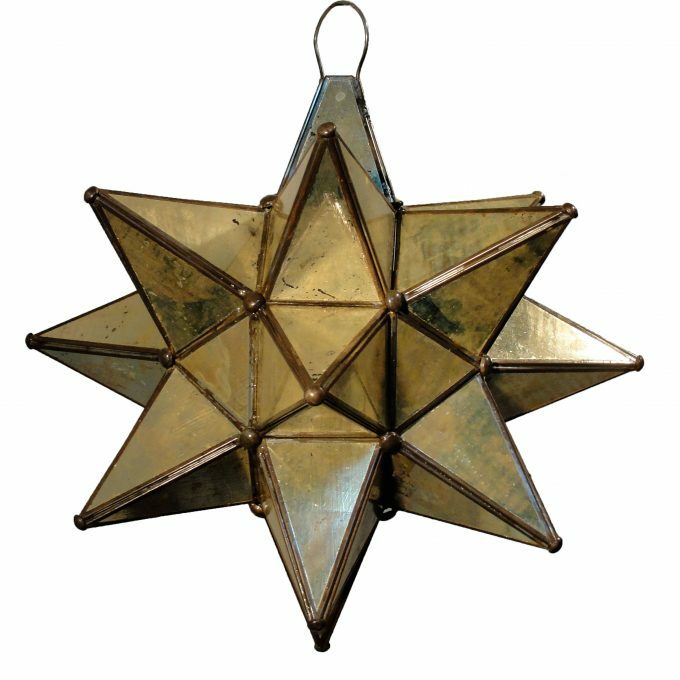 This hanging star light has antique mirrored glass panels and will add a charming rustic elegance to your home decor. We offer you three sizes, 11 inches diameter, 13 inches diameter and 16 inches diameter. Wired isoptional please choose below if you want it. This hanging star light has antique mirrored glass panels and will add a charming rustic elegance to your home decor. These beautiful star lanterns also make wonderful outdoor light fixtures for your patio or garden. All of our imported glass star lamps are handcrafted by talented Mexican artisans. Since each of our Mexican handcraft is unique, color and finish may vary slightly from what’s pictured here. We offer you three sizes, 11 inches diameter, 13 inches diameter and 16 inches diameter. Handcraft wired is optional, please check the box below if you want it.